Since the release of the Nissan Skyline 16 years ago, its popularity has not diminished one bit. The beginning and intermediate racers tend to gain interest in this vehicle. It's really a special platform that deserves our recognition. Here, we review three cars that ditched their original powerplant for a more unique setup. Haruki Iizuka has been around the drifting scene and can be seen time to time in Drift Tengoku with his slammed Skyline. He is an expert in drifting who has enrolled in the D1 Grand Prix a few years back. After taking a break from the drifting scene for a few years, he had built his best HCR32. Iizuka, being very enthused about his new creation explained to us how quickly this machine reacts to his instructions. Speed and angle was a given factor when building this machine but Iizuka wanted more than that. His objective was to build a setup that took the absolute minimal time to reach its prospected drift angle. In other words, he wanted a car to put on a drift angle very quickly. There, he thought of the lightweight SR engine combined with a rigid body. After completion of the vehicle last year, it was taken to Nikko Circuit for a shakedown run. Iizuka stated "I was shocked to learn that the vehicle control was really far off what I intended it to be. I was also beginning to question my drifting skills." The vehicle was too fast for him to keep up with, especially with the NOS setup. Mr. Inose, from the shop Friends, recommended "rather than putting on a large turbo, install a nitrous system to spin the engine for low end power. That way, the car will be quick when switching back angles." After following the recommendation and installing the nitrous, the power from 2800 rpm were born. Tremendous speed after the first corner and the following switchbacks were achieved. The body was stitched welded and fitted with a 33 point roll cage along with a rather supple suspension setup. Before, Iizuka used to ride on shortened third links in order to test out a prototype suspension coilovers. But after raising the car and doing a proper alignment, he realized how great the Skyline handles. Iizuka is determined to compete this year with his perfected Skyline. Another potential warrior has risen from the dead to rise above the sport of drifting. A V-Mount Setup for the Best Cooling! 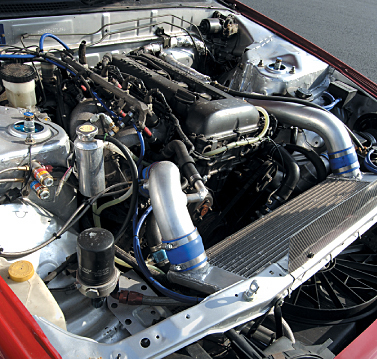 A V mount setup was incorporated since the SR20 provided lots of space in the engine bay. With dual electric fans on the radiator, the heat is disposed through the vented hood. Because of this, the water temperature never passed 90 degrees. NOS Button for That Extra Nudge! The nitrous setup for this machine is programmed between 2800 and 9000 rpms. The jets release the nitrous when the throttle is 90% or above. The nitrous system is claimed to make a huge difference especially when switching angles and reapplying the gas pedal. The NOS system was setup just like the D1 vehicles by Mr. Inose from the shop Friends. The Skyline Exceeds the Silvia! The Endless Function X suspension was chosen with 9 kg front and 6 kg rear springs. When the vehicle was raised and was allowed more suspension travel than before, Iizuka realized the true potential of the Skyline. An Ikeya Formula roll center adjuster was installed to get a proper alignment. 33 Point Roll Cage + Stitch Welded Chassis! The body was lightened and the chassis was strengthened by Garage PB. To the owner's request, a super stiff body was constructed. This was not recommended by Garage PB, but the owner stated that he will somehow get used to it. The 33 point roll cage and the stitch welding were also done. The NOS switch is where his right hand is sitting at. With this setup, the switch is activated from 2800 to 9000 rpms at +90% throttle. The wet nitrous is then combined with the fuel for a 50 horsepower boost. A bottle refill roughly costs $150.00. The diameter of the roll cage differed depending on the location, designed to distribute the load evenly. Challenging With a New Team! Iizuka has been racing his Skyline with the Wangan Halky Knights for over 10 years. Although he has competed in the D1 Grand Prix series, he has not drifted in 2 years. His plans for this year is to once again, compete in D1. He has been chosen as a leader for a new drift team. A steering rack off of a PS13 was used, with washers to increase the steering angle. The Silvia rack provided more angle than a Skyline rack fitted with washers. 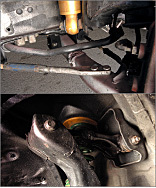 Since the sway bar and the lower arms are affected when the steering angle is increased, the tension rod was relocated. Unbelievable acceleration and slide initiation! It's evident even at course side! Last year when we saw this vehicle, it looked as though its movements were very choppy and hard to control. Iizuka kept spinning out at the 1st turn at Nikko Circuit. This time, he is completely different! The major thing we noticed this time is how quickly the car turned sideways at the entry turn. The vehicle was also very quick coming out of the turns. Its movements are noticeable even at course side. Superior Cooling Capacity and Drivetrain! The reason why Yahara decided to switch to the RB26 engine is simple. His RB25 was easily beaten by a stock GT-R with a boost controller. "I was shocked since I put a lot of money into that engine." Says Yahara. Two years later, he had swapped in a RB26 in his green metallic HCR32 and entered a drift competition as a new comer. So far, this is the 5th Skyline he has owned, and transplanted a RB26 numerous times for him to claim to be able to pull it off in two days. Yahara claims that the existing engine mounts and the member can be used and the transplant is fairly easy. However, the engine had some major cooling issues along the way. The pistons in the 5th and 6th cylinders had heat issues, often causing melt down. To remedy this issue, the cooling passages were created for these cylinders inside the engine block. This modification eliminated the problem. There is more than 10 grand poured into this engine. Yahara claims "That's chump change compared to extracting 600 hp from a RB20, SR, or a RB25!" He also believes that the 2JZ engine is one of the best, but is not a suitable candidate for a transplant because of all the hassles involved in the swap. The stock drivetrain cannot handle 600 horsepower, but by swapping in GT-R components, this problem was resolved. These kinds of measures must be taken when dealing with massive horsepower. According to his drifting style, Yahara says "I've given up trying to control the car in a sharp manner. Now, I'm concentrating on that first quick initial drift and holding onto that angle with the power I have. Since the more angle the vehicle has, the more speed it loses. That's why it's important to have lots of power." RB26 is the Way to Go! A inline 6 engine's life depends on the cooling system. In many cases,the cylinders closest to the firewall tend to run hotter than the others,resulting in a blown engine at times. The problem lies in the water passages inside the block. By widening the passage way,this problem can be resolved. The power transistor located on top of the spark plug cover was moved to the firewall. The TD06 Turbine is Good for 600 HP! The engine internals are stock. The TD06H-25G turbine was chosen because it provides plenty of torque from 3800 rpms. It very much fits the characteristic of the RB engine of starting its power stretch from the low to mid range and losing it at the top end. An RB26 off of a BNR32 or a BCNR33 can be purchased for roughly $1500 to $2000 in Japan nowadays. The Suspension Arms are Homemade! The upper and the lower arms were extended 3 more inches. These arms were calculated perfectly for the tires to sit perfectly in flush with the rolled fenders. This eliminated the use of the 3mm wheel spacers and increased the handling characteristics of the vehicle. There are adjustable pillow arms on the market, but do not provide the adjustability that of 3 inches. The entire body kit besides the front Uras bumper was designed and created by Yahara. The RT-R rear fender and door panels go really well with the overall look. The front end is also available for the BNR34 application. These aero components can be purchased at Yahara's shop named Almighty. The Drivetrain Should be Strengthened to Avoid Problems! The transmission is from a RB25 and the driveshaft and the LSD is from a BNR32. These components eliminated any drivetrain problems altogether. The rear end was adopted from a S15 because these units are known to be stronger and provide excellent traction. The knowledge gained for these components can only come from a person who truly knows the R32. Since this machine is also used for daily driving, the interior was not fully gutted. In fact, the rear seats are from that of a rare model. A ECR32 with a RB25DE is a rare sight, but these leather seats are considered a treasure. 800 HP is this Year's Prospected Goal! He has spent 6 years of his life drifting in a 4 door R32. The machine that we featured today, is his alternate vehicle. The other car is equipped with a T88-34D and is promised to supply 800 horses. One dilemma he faces is that there are not many drift competitions around his area for him to compete in. Smoke and Intensity Galore! 600 hp Put to Good Use! By witnessing first hand Yahara's drifting style, we noticed that he drifted very flamboyantly. The way he throws around his car and his throttle happy moves signify to us that he's having a blast out there! Velocity Stack Funnels Power the FR Drift Vehicle! The reason why they chose the VQ engine was "Since now is the height of the VQ engine, it's our chance to further develop it." Another important factor was that the rather than to choose the Z33 or V35, the R32 was a familiar platform. This way, they can fully put efforts into modifying the engine. A 3.5 liter V6 may sound like it's a relatively large sized engine, but in reality, it is 30 cm shorter than the RB26. The VQ engine was 150 kg (330lbs) lighter and was a setup that gave the RB26 a run for its money in regards to handling and response. Air conditioning and a full car stereo system were cleanly installed. Flawlessly Built! Everything Looks New! Dual ducts were constructed on the front bumper to direct the hot air out of the engine bay to the vented hood. This also provides cool air to the throttle bodies. We inquired how much it would cost to build an identical machine. They replied, "The vehicle itself costs $30k and the throttle body kit roughly costs $4.3k." More Room in the Engine Bay for Cooling! Since the new engine was 30cm shorter than the original, a bigger radiator was a great candidate to expel heat. The electric fans were taken from a stock FD3S. They had no problems with cooling, but the oil temperature was slowly creeping forward. The Recaro front and rear seats as well as the dashboard were covered in leather. The in-dash 6 point roll cage was also wrapped in cream colored foam to coordinate with the interior space. The air conditioning and the car stereo are still intact, and are in perfect working order. A Defi DCCS all in one meter was used for the main gauge assembly. To the left of the driver's seat, the Defi meter control panel was mounted. This box was custom made by the shop. The left device is the memory card slot for the DCCS meter, the bottom device is the VSD (windshield reflection gauge), the red button is the line lock switch, and the others are just for decorations. The suspension arms were all fabricated by Top Secret. Due to safety reasons, the arms were fully supported by welding them on together. The exhaust system is a full dual unit. The suspension coilovers are a Top Secret original unit made from Aragosta. The spring rates are front, 10kg and rear, 8 kg. Since the front has become significantly lighter, this was the perfect spring rate for drifting. Like any drift vehicle, the steering angle has been increased. The front coilovers were fitted with a Roberuta air suspension kit which makes it possible to raise the car up to 5 inches. This system does not interfere with the rest of the suspension once the switch is off. Top Secret's CEO Smokey Nagata claimed that the machine lacked mid range power but after driving, it I had to disagree. Well, it wasn't tremendous power there, but a very smooth power band that makes it very easy to drive. The RE01R tires all around were also a perfect match. I also felt that this car has better control than a Z33. Now if the power and the acceleration are set right, this can be a potential D1 car. The only thing that worried me was the oil temperature. We first expected the sound of a V6 engine was a deep growl, but to our surprise, it had a much higher note. The vehicle switched its angle very quickly because of its lightweight front end. Smokey Nagata claimed that the vehicle still needed to be tuned, but we thought otherwise. We presume Youichi's driving had a lot to do with the car's performance as well.